TAIT & HALL LAW is always available to help you with your legal questions. Do I have a Slip and Fall claim? One minute you’re testing the firmness of an avocado in the produce section of your neighborhood grocery store, the next moment you’re laying on your back on the ground with a searing pain in your shoulder, wondering what just happened. You look down at your feet and see the culprit, a puddle of water turned the tile floor into a secret slip-n-slide. Injuries from this kind of accident, a special type of Arizona personal injury case known as “slip and fall” often entitle the injured person to recover compensation from the grocery store or its insurance company where it occurred, but it’s not quite automatic. Once you’ve established that a condition on someone’s property caused your injury, the next step to determine if you have a slip and fall claim is finding out if the property owner or one of its employees acted negligently. This is how a personal injury case in Arizona would generally start. Negligence means that the grocery store or one of its employees didn’t take the steps to protect the customer from an injury that a reasonable person in their position would have. The most obvious example would be if a store manager spilled her drink on the floor, saw the liquid puddle up in front of the avocados and did nothing to clean it up for an extended period of time. Not all examples are so obvious though. What if the manager spilled her drink, notified an employee so they could clean it up, and then the customer was injured as the employee was bringing a mop and a caution sign? It may depend on how long the employee took to do that. What if the spill was caused by another customer, rather than a store employee? The answer may lie in whether and when a store employee was made aware of the spill, or whether they should have discovered it sooner. Determining negligence in slip and fall cases is not always an easy thing to do. If you find yourself wondering what you and the avocado you accidentally flung across the aisle as you fell ever did to deserve this, it’s best to consult an experienced Arizona personal injury attorney as soon as possible to find out if you have a slip and fall claim. Don’t be deterred if you didn’t actually “slip” or “fall.” Any accident case that arises from an accident on land, in someone’s house or in a retail establishment falls under the Arizona personal injury umbrella of “slip and fall.” So whether you cut yourself on the sharp edge of poorly maintained bar stool, you were beamed by a can of paint falling off a high shelf of home improvement store, or you fell into the hole your neighbor forgot to tell you about during a barbeque, it’s always a good idea to talk to an attorney to find out if they or their insurers are required to pay for your “slip and fall” injuries. We are among the very few Criminal Defense law firms in our area to have the maximum Avvo rating. A Superb rating from Avvo implies that we are fully focused on providing the best services to all of our clients. We won recognition for achieving the perfect combination of experience and passion. Tait & Hall is honored to be nominated for the prestigious Top 40 Under 40 award. Since we have a number of satisfied clients all over the state, this accolade has been a well-earned one. I will highly recommend Ryan to any one, personally i can say he is one of the best lawyers in AZ, he does his best to get the job done. He always demonstrated confidence which gave us peace of mind. He treats his clients with respect and he knows how to listen. Ryan did an excellent job in our case he persevered until the end. If you are looking for a lawyer that gets the job done and always willing to tell you the truth get Ryan. Arthur Hall used to be a former prosecutor before becoming a defense attorney. As soon as I learned that he was a prosecutor, I felt that I had an advantage not many other do. I feel that his past experience gave him knowledge of the law, but also a lot of confidence and rapport with the people who had the case against me and the judges. It was nice to feel confident in someone who had my freedom in his hands. He was aggressive with his negotiations because he knew based on my case and his prosecutorial experience what the best deal was that he could get. I highly recommend AJ to defend you. I was charged with an Aggravated Assault based on a mistaken identification. It was terrifying dealing with the possibility of going to prison for something I didn’t do! The prosecutor refused to dismiss my case for a long time, but Ryan never gave up. He kept fighting with the prosecutor until eventually my case was dismissed and I was finally able to go back to living my life! I would totally recommend Ryan to anyone who is innocent of their charges. My nephew was in the wrong place at the wrong time and ended up being charged with several serious felonies. He was facing no less than 40 years in prison! Our entire family was shocked when we found out how harsh Arizona’s laws are for people who make innocent mistakes. My nephew was such a good kid who did not deserve to be locked up for most of his life. Ryan not only answered all of our questions and helped us through the case, but truly cared about our family and my nephew. The State offered him a plea to 13-17 years. Ryan outlined all the pros and cons of going to trial, which is what my nephew did. After 3 weeks of trial, with all of us sitting on pins and needles, Ryan convinced the jury to come back not guilty on all of the most serious charges and my nephew ended up only serving a year! Our family will forever be grateful for Ryan’s passionate and caring representation. We would like to write a review for Ryan Tait as we are extremely pleased with his very professional representation on our family case. Thank for always keeping us informed . We would definitely recommend him as he has all of the necessary knowledge and experience to be an outstanding legal adviser. Thank you for always. We used AJ Hall for my daughters DUI defense. I had no prior experience with other law firms and was pleasantly surprised. My daughter was a minor at the time. AJ was very knowledgeable about the juvenile justice system. My daughters case was resolved quickly with a positive result. AJ always returned our phone calls and addressed any concerns that came up. We would use him again if needed. I was in a car accident right before being arrested and put in jail for something unrelated. I had an attorney helping me with the accident before getting arrested, but they dropped me once I was in jail. Ryan and AJ came and visited me and figured out how to get my settlement money for me, even though I was in custody. Thank you guys. 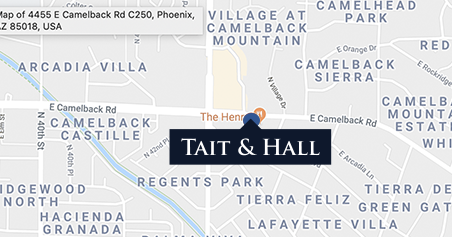 The Attorneys at the Law Firm of Tait and Hall understand the formula for successful legal representation requires exceptional client service, professional dedication and outstanding results.